Be sure to watch our great videos that show 'how to' prepare our Oven Ready Penne! Made from simple, quality ingredients, our pasta continues to be at the center of the dinner table helping families create great food and make memories. 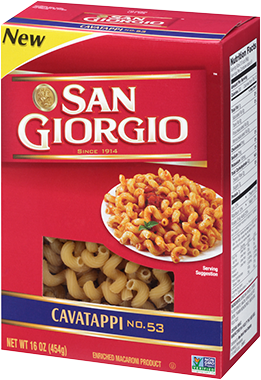 San Giorgio® is part of the New World Pasta family of brands, a leading dry pasta manufacturer in the United States. Cavatappi is a tubular corkscrew or spiral shaped pasta about 1-inch long and native to southern Italy. Use Cavatappi in entrées and side dishes, baked dishes or cold salads. Just about any type of tomato-based or cream sauce complements the versatile shape of Cavatappi.